Well done! 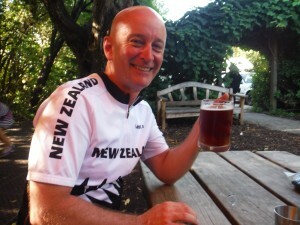 The epic New Zealand cycling adventure draws to a close. We arrived at Fairwell Spit, the northernmost point on the South Island, after yet another amazing experience on the roads. 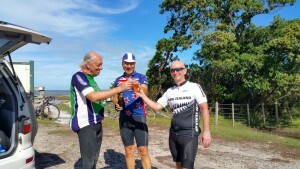 Today had a little of everything: The 3rd of New Zealand’s iconic climbs, a free-fall descent, more beautiful countryside, and finally a celebration on the beach at the end of the road. Our rollout from Matueka took us past some of the flood damage. 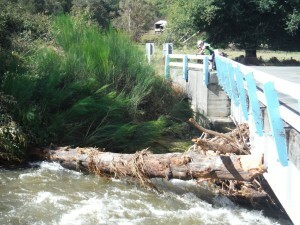 Fortunately the river had receeded some. Most of the damage was pretty minor. 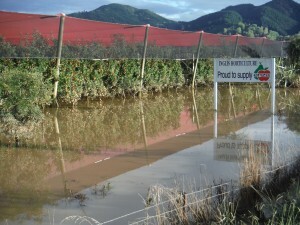 Here is a local apple orchard with the crops underwater. 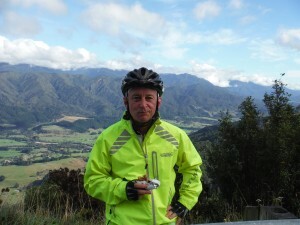 Soon enough we started the ascent up the Takaka Pass, rated as the #3 most scenic road in New Zealand. It’s not a torturous climb, but it is pretty relentless with grades in the 5-8% range most of the way and a couple of steep pitches thrown in. The views get increasingly nice the higher you climb. After a couple of photo opportunities along the way we found ourselves at the summit. Jos’s wife Lynn just happened to be coming by as we were at the summit so we talked her into taking a group photo for us. We were sweating like crazy here and decided to add some layers for the descent. 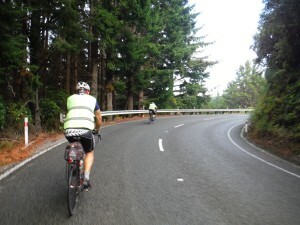 The descent was a screamer affair, with very few curves and mostly excellent pavement. You could just let the wheels fly. Our destination was the valley below, reached in the matter of a few kilometers. Looking forward to descending into the valley below! After regrouping at the bottom of the climb the hard work for the day was essentially done. We had about 60 km left, with a few rollers and a couple of steep pitches, but for the most part we just enjoyed our last few hours on the bikes. 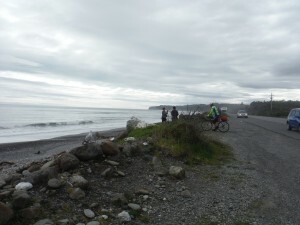 About 10 km from the finish we rounded a corner and caught our first sight of the sea. Fairwell Spit is created by the tides and wind reaching the top of the island. The sand essentially wrapps itself like a finger over the top of the island, providing a natural harbor for Golden Bay. There was a lovely symmetry to the start and end of the ride, with ocean smells and breezes providing the sensory environment. We reached the end of the paved road, but that wasn’t quite the end of the story. 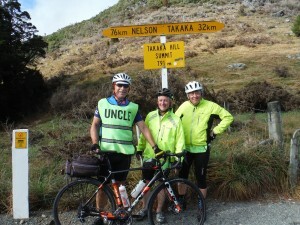 We rode another km up a bumpy gravel bit, reaching a restaurant on the top of a little hill. We took some photos, declared victory, and then decided we had to go down to the beach after all. More photos and a bottle of champagne later we had officially declared victory this time! It always seems a little strange packing the bikes at the end of an adventure like this. It never quite seems real that we’re actually finished. We did decide to do a little more celebrating though. We headed to the Mussel Inn on the way into town. This place has a beer crafted using a recipe from Captain Cook himself. One of the local plants adds the spice to this beer. Very refreshing! A well-earned rest day followed, with a leisurely breakfast, some gift shopping, a long nap, and a wonderful celebratory dinner to share some war stories from the trip and just revel in our excellent adventure. I’ve used the word “epic” a lot while describing our adventures, but only because it’s the most fitting word. The scenery, the environment, the friendship, the support from our gals, and Jos’s unbelievable organizational skills and attention detail led to an experience that we will all treasure for the rest of our days. Yesterday’s rains continued all night and into the morning. The forecast called for mid-morning clearing, so once again we suited up and headed out into the rain. We wouldn’t find out until after the ride just how severe the storms had been. Five inches of rain fell in 4 hours. Franz Josef, our destination five days ago (with the space-age public toilet), is in a state of emergency. The river flooded its banks, the city’s water supply is cut off, and one of the motels had to be evacuated. 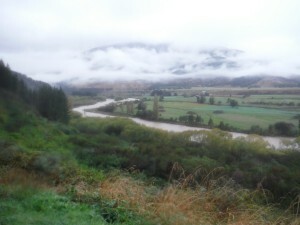 Motueka, our current rest stop, flooded overnight. 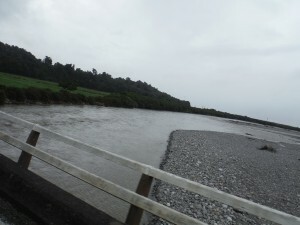 They received about 5 inches of rain in a few hours and the Motueka River (pictures later) overflowed its banks. Given all that, we’ve been extraordinarily lucky. We changed the routes on a couple of days, and yesterday we cut the ride short. 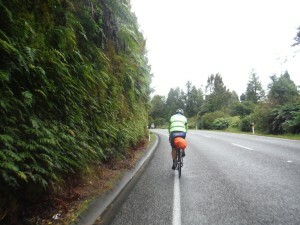 Other than that the only ill effects we’ve had have been from riding in wet cycling shorts. If our schedule had changed a day here or there things could have been very different. So we headed out this morning, ignorant of all that was going on around us, and grumbled / joked about another soggy day. 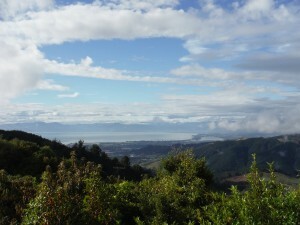 About 20 km in the rain stopped, the sun shone magnificently, and we had beautiful weather for the rest of the day. We headed up a long, pretty mellow climb, and then hit the grunting portion of the day – a 3 km goat hill with a beautiful panoramic view. This was the lunch spot for the day and we just hung out talking to a Canadian couple, enjoying the views, and drying completely out. 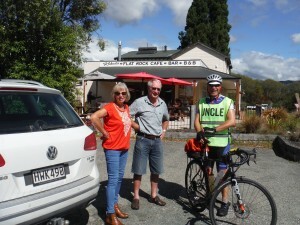 We had a coffee stop further up the road and Jos ran into a cousin he hadn’t seen in a couple of years. It’s a small world down here. Yesterday Terry bumped into a cyclist he had ridden with on a trip from Paris to Istanbul. From here all the way in to town we rode on lightly traveled bucolic roads. At one point I decided to just ride by myself for a while, watching the river rush by, listening to the sounds, and having a Zen-like moment on the bicycle. These kinds of moments are magical, and while they don’t happen very often, when happenstance presents them I try to take full advantage. No pictures here, I just lived in the moment. 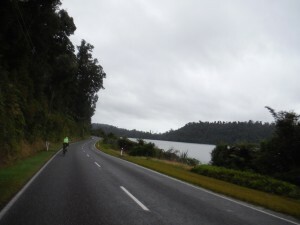 We regrouped and rode in the rest of the way on a road described by a friend of Jos and Terry’s and being the nicest road in New Zealand. I have no way of assessing the validity of that opinion, but it really was nice. The river really was raging along. 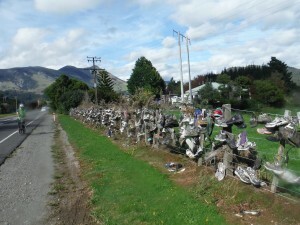 Here are a couple of pictures along the way. Tomorrow wraps up the cycling adventure! After our picture-perfect weather climbing over the Haast Pass yesterday, Mother Nature decided to throw us a curve ball. A cyclone is swirling around the south Pacific, with a high pressure ridge on the East coast. The result is essentially a squeegee wringing water out of the cyclone all along the Westlands area where we are located. Necessity being the Mother of invention, we’ve had to revise our plans. The weather forecast for day 6 called for strong rain developing later in the day, along with beastly winds, so we decided to skip several miles in the beginning of the ride. It turned out to be an excellent idea. 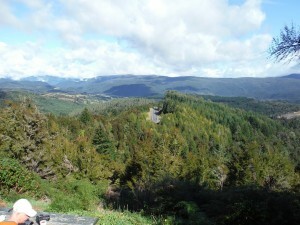 We started from the ocean lookout, having skipped a couple of major hills and about 2 hours of riding. A monster day became much more manageable. The lushness along the road is quite beautiful, with ferns and dense forest lining the road. Given the relative shortness of the day we weren’t forced to power through everything, and instead just kept up a modest, steady pace. 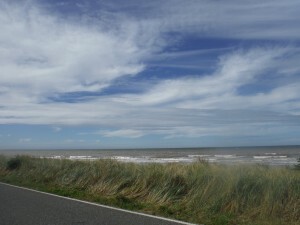 We had arranged to meet the van at the next beach location, quite a lovely spot. When we got there the group was feeling strong enough that we just carried on. Our bodies are all varying degrees of trashed, but at the same time we’re riding ourselves into shape. The strong rider varies from moment to moment, with each of us having good stretches and other moments where we could use a nap. 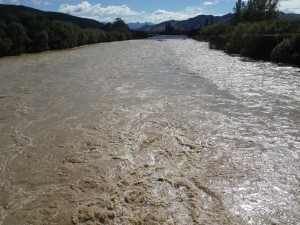 This section of New Zealand can receive over 300 inches of rain a year. It occasionally will receive a meter (39 inches) of rain in a day. This storm wasn’t that strong, but the national news weather forecast scale was red, the maximum setting. We took that seriously. Rain is forecast for the next several days. Utterly torrential rain came pouring down during the night. 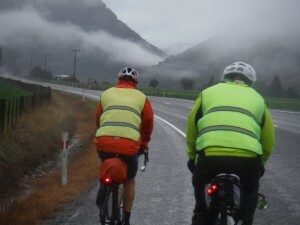 Riding from Fox Glacier was simply not an option. 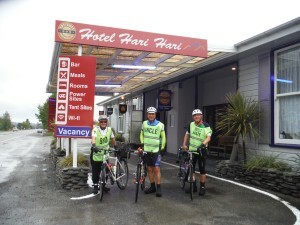 The weather map showed drier conditions up the road in Hokatika, our destination 2 days hence. We decided to drive there, check out the weather, and decide on our plan. 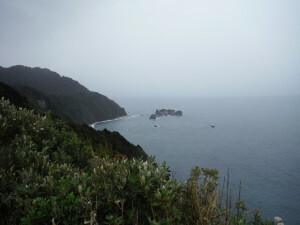 Rain absolutely bucketed down during the morning drive, but Hokatika was dry when we got there. 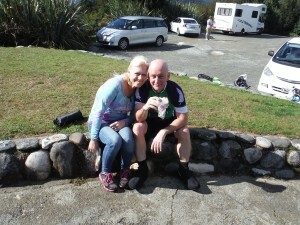 After a little retail therapy where I picked up a nice bike jersey and Agnes found a jade piece (Hokatika is the heart of the New Zealand jade industry) and a bit of lunch, we decided to try the trip in reverse. Rather than fight the 30 km/h headwinds we would have had, we now had a powerful ally in the wind. We flew down the road, averaging 35 km/h for stretches and making epic time. After a short break in the town of Ross, where we met a local character who owned a bunch of motorcycles and drank beer for breakfast (and lectured Amy about smoking while sucking down another 24 oz beer) , we headed back out where we once again met up with the rain. Our next stop was in a funky little restaurant / store place called Bushmans with a gigantic plastic sandfly mounted outside. Amy took a ton of pictures. Terry decided he’d had enough at that point and called it a day. He was soaked and developing hypothermia and made the sensible choice. Jos and I weren’t quite that bright so we carried on. About 50 yards down the road the skied opened up again, and we got soaked the entire way back. Fortunately it was a pretty warm rain, and actually was fairly pleasant. We didn’t do any sightseeing though, cranking as fast as we could go. I hit 55 km/h on one rainy descent, probably not the smartest thing I’ve ever done, but with Jos’s 28 mm tires the ride actually felt really steady, We got back to the hotel completely waterlogged, but with a good story to tell. Ride day 8 brought more of the same. The skies were threatening once again, but we decided to continue heading south to Franz Joseph glacier. 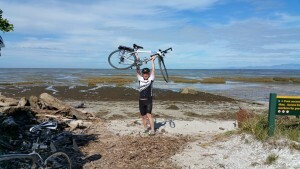 It was only 63 km away and the skies were threatening so we basically made the day into a hammer-fest. That was great for about 45 km, and then my legs turned to jello. Jos led me in the rest of the way. We skipped the section between Fox Glacier and Franz Joseph Glacier, about 25 km of goat hills. Jos and I goofed on Terry and told him we should just continue on and ride this nasty bit. Needless to say, he wasn’t buying. The town of Franz Joseph has some public toilets that are straight out of a science fiction movie. A robotic science fiction voice from 2001 a space odyssey says “ Welcome to Exeloo, please press button to close door. Your maximum use time is ten minutes.” , and then plays Star Trek music. Pretty entertaining. We made a public display of ourselves changing out of wet riding gear in a park across the street from the restaurant where we went for lunch, and then drove back to Hokataki, where we finally have a rest day. We’ve ridden 6 days in a row, and 8 of the last 10, and are all ready for a nice day off.